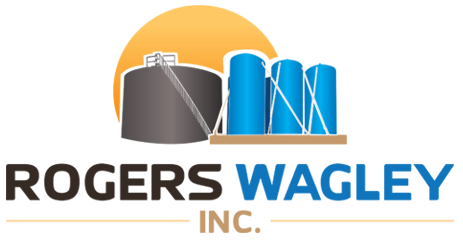 Welcome to Rogers Wagley Inc.
Rogers Wagley Inc. prides itself in working with cooperatives, chemical and fertilizer companies, and many other ag businesses to offer a complete package for their project. So whether you are looking to expand or starting a new project, Rogers Wagley Inc. has competent, reliable personnel to help you through your project. We can put together a package to present to your board or owners to give them peace of mind as to the total project costs. We have many years experience in acquiring state permits. We are a master distributor for Design Tanks and can offer unmatchable prices. We also work with other companies to offer competitive prices on stainless steel and poly tanks. We have our own crew to construct secondary containments whether it be wooden or steel. We work side by side with many others to offer load pads, ag buildings, earthwork, electrical, automation, and plumbing. In specializing with these projects year after year, we can offer very credible ideas and concepts in making your project a success by ensuring its efficiency. We have season tickets and single games available, just give us a call!